Hello! And thank you for stopping by. 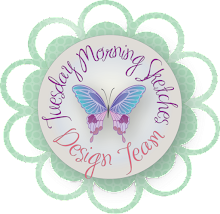 Our sketch is up at Tuesday Morning Sketches and it's a great one for layers, windows, frames or even a filmstrip for a scrapbook page. My card features the card stock and stickers that was part of the April Simon Says Stamp monthly kit. I love this paper - I don't know what color it is - but it's gorgeous. I cut a strip of 2 1/8 x 5 1/2 inch white card stock and then cut squares out of it. It's not perfect but I'm not perfect so it's okay. I then cut smaller squares to be be the back drop for the stickers. 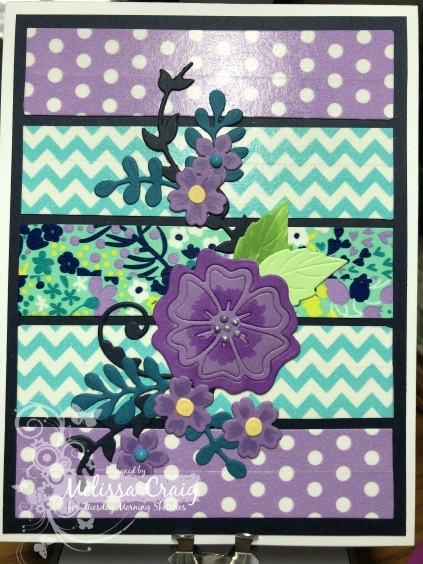 I used squares layering dies by Tonic Studios. The 3 elements are stickers from the kit. And then I embossed some lines using my Scor-Buddy. This is such a super easy notecard. So easy, that I made another in minutes while chatting with my sister. Same concept - I just covered up two of the windows with one sticker. I hope these cards provide some inspiration and we'll see you over at the TMS blog. We have a guest designer this week, too. Hello friends! Thank you so much for stopping by. The sketch is up at Tuesday Morning Sketches and it's another great one by Debbie. Lots of design elements with so many possibilities. My card features stamps from the latest stamp set by Simon Says Stamp. Inks from Tonic Studios - Nuvo Inks. I colored in the sentiment using 2 shades of yellow Copic markers. I absolutely love the texture from the dots and the embossing folder. 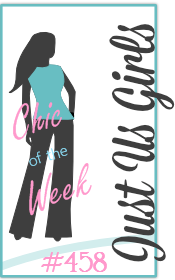 We'll see you over at the TMS blog! Hey everyone! Thank you for stopping by blog - I appreciate your visit. The latest sketch is up at Tuesday Morning Sketches and it's a great one! So much open space for your creativity. 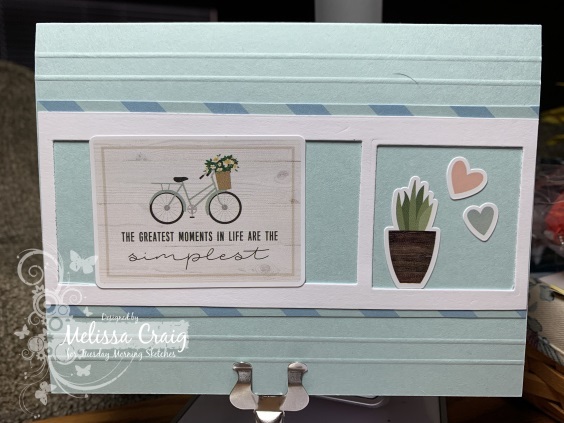 My card features the Amazing stamp set from March 2019 Simon Says Stamp kit. I love the art work - it's so retro. 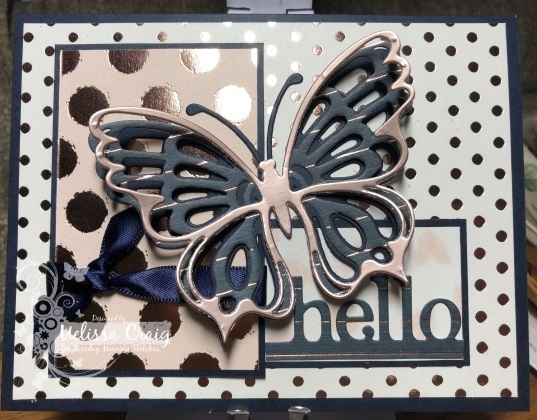 The butterfly stamp/die is from Pink and Main and the sentiment label is from Spellbinders. The sentiment, in full says, "Have I told you lately that you're amazing?" - well all that wouldn't fit so I blocked it all out and just inked up "amazing." The technique is called Joseph's Coat - it's been around for a long time. 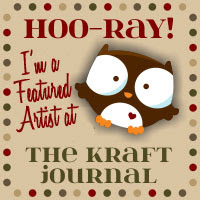 I know I did something like this when I first joined Stampin' Up! 21 years ago. I used Distress Oxide inks on Bristol Smooth card stock. I blended on 3 colors that I honestly can't remember what they were - Peacock Feathers was one of them. I then stamped the images and clear embossed them. Then I covered the whole panel with Chipped Sapphire. Once it was fairly dry I buffed the ink off of the images to brighten them up. I got this new embossing folder at Joann's - 50% off so I used it on the pink panel. I love how this turned out! I hope to see you over at the TMS blog and be sure to leave some love for the team. Hello! Thank you so much for stopping by. I appreciate your visit. 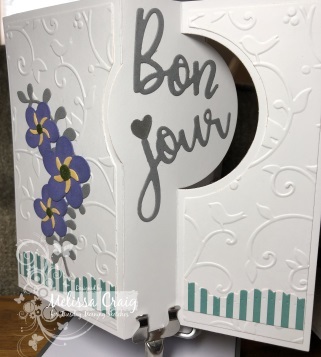 The latest sketch is up at Tuesday Morning Sketches and I must confess, I honestly put this sketch together drawing inspiration from dies by Spellbinders. But you know what? You don't need these dies to make a beautiful card. Just check out what the design team did with this sketch. My cards, however, feature the dies. Here's the card the right way - this will make more sense in a minute. 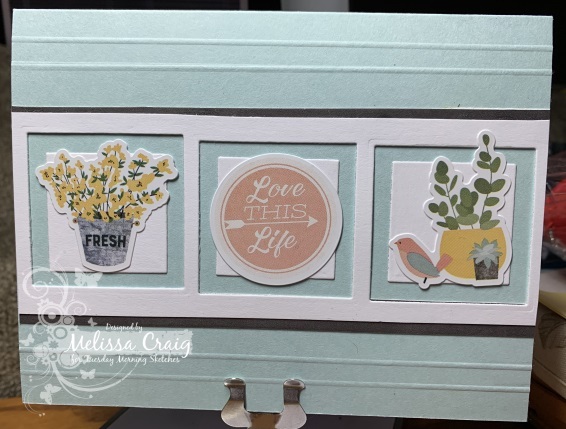 This card also features paper received in a Simon Says Stamp kit and stamps from Gina K Original Wreath builder set and the mini wreath builder set. 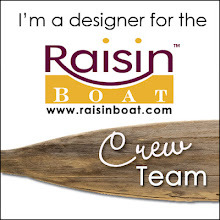 The base card is Sweet Cheeks from Raisin Boat (no longer available). Now, this next card is how Spellbinders intended the die - but I made this to follow sketch but I didn't emboss the panels correctly so it has to be the "backwards" version of the sketch. 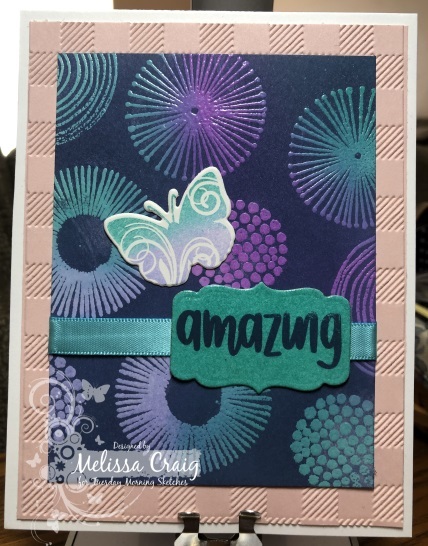 I used an old Cuttlebug embossing folder. Then when you open the card - you reveal the sentiment. This is from a more recent die set - January Large Die set. ~Maybe it was December. Whatever! So the die is a large word die and I had to cut it to fit on the circle but I think it turned out great! I hope you enjoy my cards and it inspires you to create something beautiful. Like I said, you don't need these dies to create a card using this week's sketch but if you have it, use it. 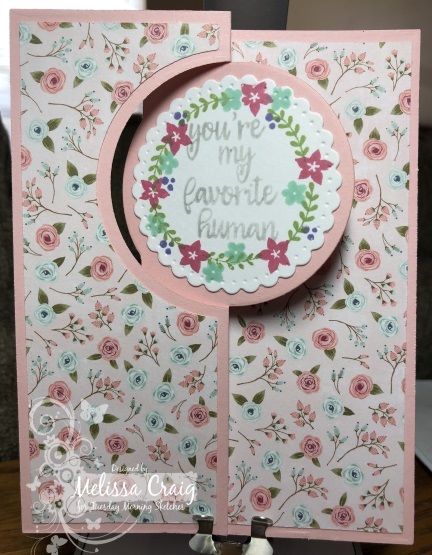 If you'd like to make this card and don't have the dies there are some great tutorials on You Tube, like this one from my old pal Lindsay Weirich. See you over at the TMS blog. Hello and thank you so much for stopping by! 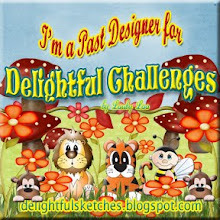 The newest sketch is up on Tuesday Morning Sketches blog and this one is a fun sketch by Debbie. So much possibility. 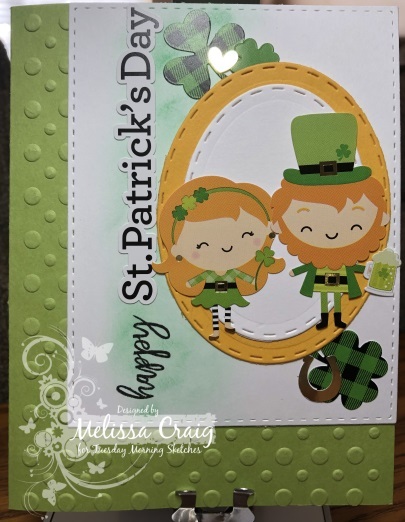 My card features some dies from the March large die kit from Spellbinders. Love these butterflies! It also features some leftover paper from a previous Simon Says Stamp monthly kit. The sentiment is from Spellbinders - the very first small die of the month kit I ever got. I did forget the 3 elements on the right side of the sketch but with all the polka dots from the paper, it was probably a good thing I forgot them. This was a really easy card to put together and not a single stamp anywhere. I like being able to use my dies. I'm afraid they'd go forgotten, if I didn't push myself to use them as often as I could. Well, please join us over at the TMS blog - leave some love for the team. Have a great week! Hello! Thank you for stopping by. The newest sketch is up at Tuesday Morning Sketches and it's a lovely sketch. I could have played with this one for hours! I had so many ideas. Of course, this could be from lack of creativity for nearly a week. I actually just out of the hospital a few days ago. Monday night I had a gallbladder attack which resulted in having it removed on Wednesday. I came home Thursday and will finally go back to work tomorrow. I got creative on Sunday while chatting with my sisters. I didn't get far and had to take a 2 hour nap but it felt great to play. 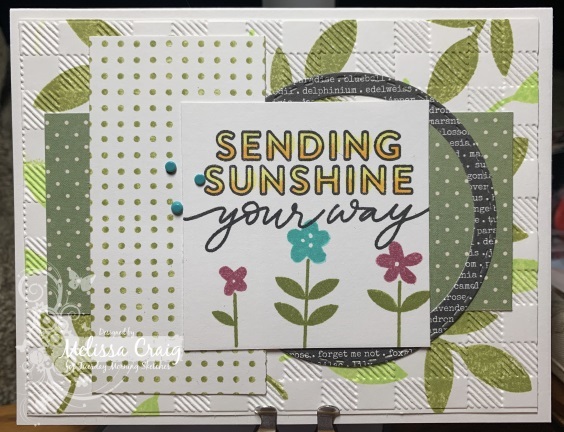 My cards features card stock and stickers that came in the March Simon Says Stamps kit. Truth be told, this is probably another one that I should have passed on but since I didn't, I vowed to use it. Here's what I came up with. As I said, I used card stock that came in the kit so I'm not sure of the color names. The stickers came from the sticker sheet. I did lightly add some Lucky Clover ink to sort of halo the sentiment. The "happy" part is a stamp from a previous SSS kit. I never really thought about layering stickers before but I think this turned out great. The cards feature dies from Papertrey Ink and CC Designs. 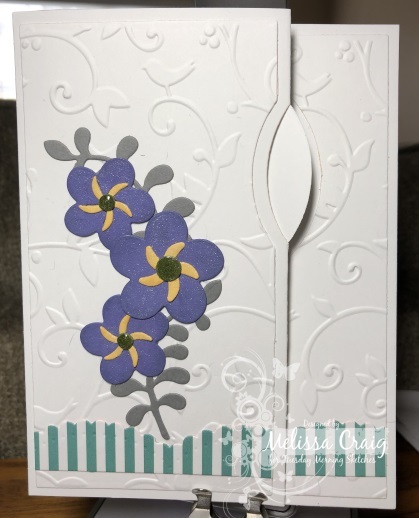 The embossing folder used is by Darice. These cards were so easy to put together. It went relatively quickly when I figured out what I was doing. 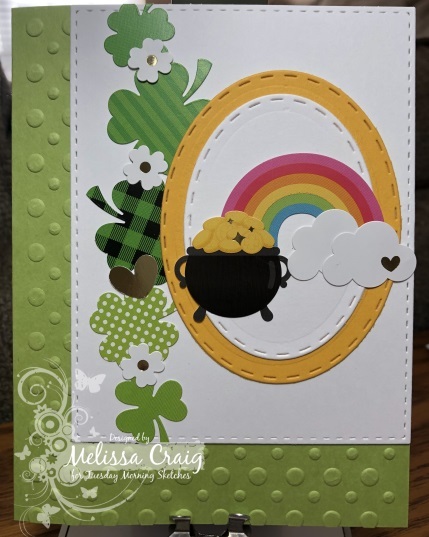 I don't usually make St. Patrick's day cards - I'm not Irish. But these turned out great and will be sent to the two patients I send cards to weekly. Maybe they celebrate this festive occasion. Be sure to join us at the TMS blog and leave some love for the team.